These documents identify the dates le.SPW were allocated for delivery and the number to be delivered. They also show the date they shipped and in some cases will show the date of arrival and the train number. Though mostly accurate these should not be considered the absolute truth. Especially in the case where other, more compelling, evidence might contradict. 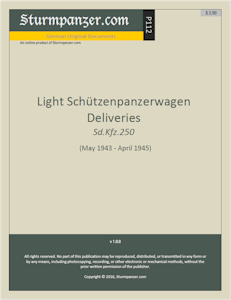 These are for armored medium half-tracks (Sd.Kfz.250) only. The armored medium half-tracks (Sd.Kfz.251) are accounted for separately.